"It is like a dream come true," said Greg Bryant, a member of the Ridge Protectors, an organization opposing a proposed wind project in the Northeast Kingdom. "The Vermont Department of Public Service has filed testimony opposing UPC's application to build industrial wind turbines on the undeveloped ridge lines of Sheffield and Sutton, Vermont." "This testimony is reassuring and historic for the protection of Vermont 's pristine mountain tops," said Bryant. The Department's testimony had several significant findings that could well lead the Public Service Board to deny a certificate of Public Good to the UPC wind developers. Noting that the place where the project is to be built is defined as a Rural area in the regional plan and given the undeveloped nature of the site and the large size of the proposed project "the turbines will be out of scale and out of character with the surrounding area." For this reason, the department believes that the proposal is inconsistent with the land use provision of the regional plan. Another significant fact in the Department testimony is the finding that the proposed project does not conform to the orderly development of the region, an element necessary to comply with the Regional Plan. Citing the recent establishment of the King George School the department states, "The area is ripe with private education facilities built upon the business model of private tuition for educational purposes." The testimony then goes on to state that this tradition is both very old and very young and goes on to site specific examples: Lyndon Institute, St. Johnsbury Academy, the Riverside Day School, St. Paul's Catholic School, Sterling College, and the King George School. Recognizing the economic impact of this tradition on the regional community, the department goes on to note the specific financial impact that the King George School has on the local community. According to Karen Fitzhugh, the school currently employs 47 full-time staff with a payroll of 1.2 million dollars and spends 750,000 dollars within the regional community. The school has made it clear that if the wind development takes place, they might well have to close the school. "A payroll of the size of this school's is a very significant economic generator for northern Caledonia County ... the risks of the school's demise, in my opinion, could outweigh the benefits of the proposed wind generation project," said Robert Ide in his testimony to the Board. Probably the most significant finding in the Department's pre-filed testimony addressing project aesthetics is its conclusion that the UPC wind project will have an undue adverse impact on the surrounding natural and visual environment. Specifically, if built, the project might unreasonably interfere with the public's use and enjoyment of Crystal Lake State Park . This finding alone could force this whole project to be reviewed under the Quechee test which might be very difficult for this project to meet. "All of these findings will make it very difficult for this project to move forward," said Bryant. "We have opposed this project for a long time for all the right reasons," Bryant said, "it is wonderful to have the state join our efforts to preserve the natural beauty of these ridgelines." Ridge Protectors is a non-profit grassroots organization dedicated to preserving Vermont's undeveloped ridgelines. There are over 250 members of Ridge Protectors, based in Sheffield, Vermont. Sanders said he had been opposed to the increased power production at the Vernon plant, and he was opposed to extending its federal operating license beyond 2012, when it is due to expire. That statement drew the largest applause of the evening. There's the rub. Vermont Yankee provides a third of the electricity used in Vermont. That's an average load of about 215 megawatts (forget about how much it is likely to have increased by 2012). By the productivity record of the Searsburg wind power facility (average output of 21% capacity), it would require 1,024 megawatts of wind power to produce that average load. That's over 500 turbines of the size currently proposed in Sheffield and Sutton (26 400-feet-high 2-megawatt machines over 3 ridges). But unlike the steady supply from Vermont Yankee, the energy from wind would be intermittent and variable and would rarely coincide with actual demand. For planning purposes, most grid managers (as in a recent New York study) assume an effective capacity for wind of one-third its average output. That is, Vermont would actually need to plan to erect 3,072 megawatts of wind -- more than 1,500 Sheffield-size turbines -- to replace the energy we use from Vermont Yankee. But that still wouldn't be enough. The assumption of effective capacity only applies when the penetration of wind is well within the excess capacity of the system, when the unpredictable load from wind can be adequately balanced. Once the system has to rely on wind to actually meet demand -- as in attempting to replace a base load provider of a third of Vermont's electricity needs -- wind power's effective capacity starts heading towards zero. This has been found independently by Irish and German government studies. In other words, when wind capacity exceeds the capacity of other sources on the system to cover for it, its true value is revealed. If you could cover the hills with giant strobe-lit wind turbines, along with their roads, transformers, and high-voltage power lines, you would still be using the same sources as before to get your electricity. Only the lazy, insane, and greedy could support such a destructive boondoggle. Closing down Vermont Yankee would benefit all of us, but industrial wind isn't what's going to make that possible. The July 26 newsletter from New England's Conservation Law Foundation reports that a Vermont judge ruled that construction of the "circumferential highway" ("the Circ") around Burlington must remain halted until an adequate environmental review is completed. The CLF "has opposed the Circ since 2002, arguing that the highway will not solve transportation problems in the area. Instead, the Circ will cause more sprawl and more pollution." But the CLF is also sad, because inadequate environmental review, like that keeping the Circ on hold, as well as numerous concerns among the general public about the impacts of development pressure, like those in Massachusetts' ocean, has caused the denial of a permit to erect four giant wind turbines on East Mountain in the wilds of northeast Vermont. The project will not solve energy or pollution problems in the area and will instead cause more sprawl and visual pollution. CLF has clearly, insanely, taken the wrong side on the issue of industrial wind power. Word comes from West Virginia that the state Public Service Commission (PSC) has thrown out an application to erect 50 giant wind turbines (400 feet tall, 2 megawatts each, sprawling along 6.5 miles of ridgelines) on Jack Mountain. Congratulations, Friends of Beautiful Pendleton County and Citizens for Responsible Windpower ! The application by Liberty Gap Wind Force, a subsidiary of U.S. Wind Force, represented by notorious coal lobbyist Frank Maisano, was rejected because the company would not allow an independent hydrology consultant on the proposed site. Wind Force claims that they required a liability waiver to allow the hydrologist on the site, but Friends of Beautiful Pendleton County noted that they had allowed PSC staff on the site without such a waiver. The PSC recognized it as a delaying tactic and "unreasonable and contrary to the public interest." They also cited "repeated unreasonable behavior." Hearings were scheduled to begin next month but have now been canceled. Thanks to Sam Smith's Progressive Review, we now know that the claim that Hezbollah went into Israel to kidnap 2 soldiers is yet another lie. The soldiers were arrested for illegally entering southern Lebanon, and bombing by Israel was already in progress. The Lebanese Shiite Hezbollah movement announced on Wednesday that its guerrillas have captured two Israeli soldiers in southern Lebanon. "Implementing our promise to free Arab prisoners in Israeli jails, our strugglers have captured two Israeli soldiers in southern Lebanon," a statement by Hezbollah said. "The two soldiers have already been moved to a safe place," it added. The Lebanese police said that the two soldiers were captured as they "infiltrated" into the town of Aitaa al-Chaab inside the Lebanese border. The Lebanese Hezbollah movement announced Wednesday the arrest of two Israeli soldiers in southern Lebanon. Lebanese police said that the two soldiers were arrested as they entered the town of Aitaa al-Chaab inside the Lebanese border. Israeli aircraft were active in the air over southern Lebanon, police said, with jets bombing roads leading to the market town of Nabatiyeh, 60 kilometers south of Beirut. According to the Lebanese police force, the two soldiers were captured in Lebanese territory, in the area of Aïta Al-Chaab close to the border, whereas Israeli television indicated that they had been captured in Israeli territory. "With a worldwide disaster looming just a few years ahead, it is a time of unrestrained corporate greed, false religiosity, moronic fecklessness, and evil intent in high places." That's from the description by Thomas Pynchon of his new book, Against the Day, set in the years from 1893 to the early 1920s, which is scheduled to be published December 5. Recently, the National Geographic Society and the New York Audubon society, like many companies, such as Whole Foods and Tom's of Maine, have claimed that they are buying "wind power." But in fact they are only buying "green tags." Green tags represent the output of a renewable energy plant, such as an industrial wind power facility, and they can be sold in addition to the actual energy produced. They were invented by Enron to increase the possible sources of revenue for wind plants. But buying green tags does not add renewable energy to the grid, because that energy was already sold to the grid. As National Wind Watch board member Eric Rosenbloom says, "It's as if a grocery store sold a box of cereal to someone but keeps the box to sell later to someone else. The first customer gets the cereal (and the prize), and the second customer just gets the empty box. You can put it on your shelf and tell people you bought a box of cereal, but in fact you did not." In buying green tags, an organization thereby supports wind energy projects by providing them with extra money. That is all that can be claimed. They are not buying wind energy -- neither for themselves nor for others. Here are some Israeli girls writing notes on missiles to the people of Lebanon. And here's one of the recipients. Alexander Cockburn has written an excellent background piece at Counterpunch about Israel's attack on Lebanon. He looks at the already forgotten history of a few weeks before Hezbollah's kidnapping of two Israeli soldiers. 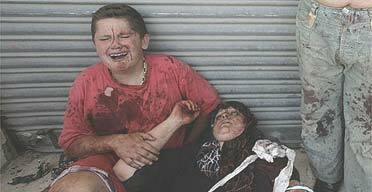 ... June 20, 2006, when Israeli aircraft fired at least one missile at a car in an attempted extrajudicial assassination attempt on a road between Jabalya and Gaza City. The missile missed the car. Instead it killed three Palestinian children and wounded 15. Now we're really in the dark ages, reaching far, far back to June 9, 2006, when Israel shelled a beach in Beit Lahiya killing 8 civilians and injuring 32. Israel regrets . . . But no! Israel doesn't regret in the least. Most of the time it doesn't even bother to pretend to regret. It says, "We reserve the right to slaughter Palestinians whenever we want. We reserve the right to assassinate their leaders, crush their homes, steal their water, tear out their olive groves, and when they try to resist we call them terrorists intent on wrecking the 'peace process.'" This time we have to go far, almost unimaginably far ... In 1982 Israel had a problem. Yasir Arafat, headquartered in Beirut, was making ready to announce that the PLO was prepared to sit down with Israel and embark on peaceful, good faith negotiations towards a two-state solution. Israel didn't want a two-state solution, which meant -- if UN resolutions were to be taken seriously -- a Palestinian state right next door, with water, and contiguous territory. So Israel decided to chase the PLO right out of Lebanon. It announced that the Palestinian fighters had broken the year-long cease-fire by lobbing some shells into northern Israel. Palestinians had done nothing of the sort. I remember this very well, because Brian Urquhart, at that time assistant secretary general of the United Nations, in charge of UN observers on Israel's northern border, invited me to his office on the 38th floor of the UN hq in mid-Manhattan and showed me all the current reports from the zone. For over a year there'd been no shelling from north of the border. Israel was lying. The killing got so bad that even Ronald Reagan awoke from his slumbers and called Tel Aviv to tell Israel to stop. Sharon gave the White House the finger by bombing Beirut at the precise times -- 2:42 and 3:38 -- of two UN resolutions calling for a peaceful settlement on the matter of Palestine. Occupy a country, torture its citizens and in the end you face resistance. In Israel's case it was Hezbollah, and in the end Hezbollah ran Israel out of Lebanon, which is why a lot of Lebanese regard Hezbollah not as terrorists but as courageous liberators. The years roll by and Israel does its successful best to destroy all possibility of a viable two-state solution. It builds illegal settlements. It chops up Palestine with Jews-only roads. It collars all the water. It cordons off Jerusalem. It steals even more land by bisecting Palestinian territory with its "fence." Anyone trying to organize resistance gets jailed, tortured, or blown up. So here we are, 24 years after Sharon did his best to destroy Lebanon in 1982, and his heirs are doing it all over again. Since they can't endure the idea of any just settlement for Palestinians, it's the only thing they know how to do. Who's misguided about wind power? The editorial of July 21 ("What's the fuss over wind?") asks, "What is more of a danger? A spinning turbine blade, or nuclear waste by the Connecticut River? What is more damaging to Vermont? A wind farm on a ridgeline, or the trees on that ridgeline dying off from acid rain and pollution generated by coal-fired power plants?" At this stage in the debate, the irresponsibility of those questions is inexcusable. Even the promoters of wind power on the grid can no longer get away with pretending it will displace energy from coal or nuclear power plants. (Vermont doesn't even use electricity from coal plants!) Those plants provide base load power. As a highly variable and intermittent source of energy, wind turbines would only provide occasional peak load power, occasionally when actually needed. If we erected all 350 megawatts of giant turbines that have already been proposed in Vermont, or twice that amount, which many advocates would like to see (without, as classic NIMBYs, actually having to see or hear them near their own homes), we'd still suffer from the same amount of nuclear waste and acid rain. The Mountaineer wind power facility on Backbone Mountain, Tucker County, West Virginia, which kills thousands of bats every year (and owner Florida Power & Light has therefore halted access to researchers so they and other developers can get on with erecting hundreds more giant (and useless) turbines on this ridge that spans West Virginia, Maryland, and Pennsylvania). "I did notice, in the next few months, that the animals were more abundant down here in the valley, in the farmers' fields and such. Places that they had steered away from before, they now were in, and causing trouble for man, and, in turn, getting shot. I saw more bear and bobcats in the populated areas than I had ever seen. I went up to the windmills several times to check, and it seemed that the animals had moved away from that area. There were no sight of them, no prints, no sign." Mostly treeless and curving gently across the ... landscape, the Flint Hills are home to the largest remnant of native tallgrass prairie in the world. Newcomers driving through this sublime setting ... are stunned by their first glimpse of this gorgeous landscape. Yet this national treasure has already been desecrated by a massive industrial wind power facility and is targeted for yet more. Compare these pictures of the area before construction and the very unsublime result. And all those towers won't do a thing to change our energy use. More pictures are available from Protect the Flint Hills. The editorial of July 19 ("For the birds") rightly recognizes the need to curb the use of fossil fuels. It therefore warns of the damage from drastic climate change compared with that caused by "a few wind projects." That is an irresponsible statement. Wind turbines generate electricity, which in Vermont already comes almost exclusively from non-fossil fuel sources. So big wind would not "curb the use of fossil fuels." Even in places where the electricity does come from fossil fuels, wind turbines would not threaten in any way the steady base load provided by coal. And wind's intermittency and variability require other sources to stay on line. The greater load balancing burden may even cause those sources to burn more fuel not less. Wind promoters can not show a single example of other fuels being reduced because of wind turbines on the grid. That's just concerning electricity. Most fossil fuel is burned for transport and heating. So it is irrelevant to compare the potential damage from "a few wind projects" to that from climate change. No matter how many giant wind turbines we erect, it will have no effect on fossil fuel use. Giant wind turbines will only add damage of their own, without any mitigating benefit at all. Provided by Save Western New York. UPC, the company proposing 26 behemoths over several ridges in Sheffield and Sutton in northern Vermont, have sponsored a bus tour to visit the eleven 9-year-old Searsburg turbines in southern Vermont. They might as well take people to see the toy turbines at Legoland. The Vermont Public Service Board announced today that it has denied the application for a "certificate of public good" by East Haven Wind Farm (Mathew Rubin and Dave Rapaport). Click the title of this post and scroll to July 17 for the final order, which includes the hearing officer's recommendation and subsequent comment. 1. The findings, conclusions and recommendations of the Hearing Officer are hereby adopted, as modified above. 2. The proposed Project will not promote the public good of the State of Vermont, and a certificate of public good shall not be issued pursuant to 30 V.S.A. §248. Dated at Montpelier, Vermont, this 17th day of July, 2006. This is the precedent everyone on both sides has been waiting for. Maybe VPIRG and the Conservation Law Foundation can now return to protecting people and the environment instead of insanely promoting industrial development (of highly doubtful merit anywhere) in threatened rural and wild areas. A web site that provides resources for and information about New York battles against industrial wind power development was recently created. It also hosts sites for local organizations. Conservation Law Foundation embraces "wise use"
In flagrant contradiction to their mission of protecting New England's environment, the Conservation Law Foundation (CLF) uses the tricks of industry public relations in -- hand in hand with industry -- promoting the erection of giant wind turbines in wild and rural areas. Their recent fund-raising plea boasts that CLF is a "leading force ... for fair review of renewable energy projects." The mission of the "wise use" movement is not the precautionary principle that has traditionally guided environmentalists but to show that in balance the harm could be worse, i.e., industry pretends to be "green," pays off a few organizations, and continues to do what it always did. Part of this effort is to complain that regulations and environmental reviews and public input are unfair burdens, because there is a small chance that a project will be prevented. And the developers take great umbrage that they are not free to do whatever they want. Thus when CLF calls for fair review of renewable energy projects, it implies that subjecting them to the same review required for any industrial-scale development -- particularly in rural and wild locations -- is unfair. That is an opposite message from CLF's avowed mission. Those reviews are there to protect New England's environment. Calling a power plant "green" doesn't make its impacts on the land and its denizens any less. Vermonters with Vision and Ridge Protectors, which is currently fighting massive development on ridges in Sheffield and Sutton, have produced a nice trifold brochure. It is not specific to Vermont and could be used by groups elsewhere as well. Click on either of the images to download the repro-ready PDF (80 KB). The company fighting to build a landmark clean wind power project off Cape Cod is raising eyebrows among friends and foes alike with its latest energy idea: a diesel-burning power plant in Chelsea across the street from the city's elementary school complex that will emit soot and other pollutants. Chelsea has one of the worst air pollution problems in New England, in large part because of diesel exhaust from trucks rumbling through city streets and on nearby highways. Any diesel plant, no matter how clean the technology, will spew additional pollution into the air that can contribute to childhood asthma rates that are already among the state's highest, said [Roseann Bongiovanni, vice president of the Chelsea City Council]. PPM Energy [a subsidiary of Scottish Power] has fragmented and damaged 8,000 acres of the endangered Flint Hills Tallgrass Prairie ecosystem with the Elk River industrial wind complex. They pay no state or local taxes, but will donate $150,000 per year to Butler County in hopes that we will overlook the fact that foreign and out-of-state investors transformed pristine virgin prairie into a "government subsidy farm." It's time for the public to recognize that wind energy developers are not as concerned about the environment as they are about making large amounts of money. If developers really cared about the environment, they would not target ecologically sensitive areas. They would pursue wind leases in locations that are suitable for industrial development. This problem is not unique to the Kansas Flint Hills. Throughout the world wind developers are attempting to build facilities in unspoiled natural places. Rather than focus on finding appropriate locations for wind turbines and protecting the environment, they focus on the corporate bottom line. UPC, the company proposing 26 400-foot-high wind energy machines in Sheffield and Sutton [Vt.], took out a full-page ad in the July 1 Caledonian-Record (page B4). This was in reponse to the 48 people that were not employees of UPC who testified at the June 26 Public Service Board hearing in Sutton -- all of them describing the project's many negative impacts and its lack of significant benefits. UPC's ad quotes Abraham Lincoln that a dog still has four legs even if you call the tail a leg. They then proceed to argue that the tail of their dog is indeed a leg. But, as Bill Clinton used to say, that dog don't hunt. 1. 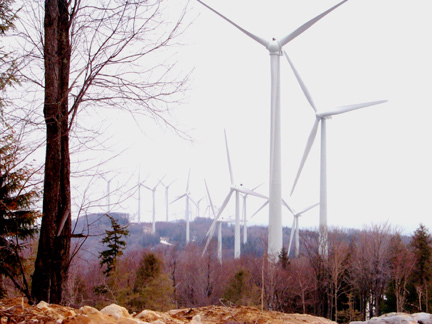 The Sheffield/Sutton wind energy facility will not help Vermont meet its energy needs. One third of the time, it will produce no energy at all. Another third of the time, it will produce at a rate well below its already low annual average of 20-30% of capacity. The largely unpredictable variability is in response to the wind rather than user demand. It is therefore mostly useless for meeting our energy needs. 2. Wind energy does not make the air cleaner. Because it is so variable, it does not displace the use of other fuels. Because it adds to the balancing burden on other sources, wind energy may even cause more pollution. No promoter has been able to show any evidence of reduced greenhouse gas emissions due to wind energy on the grid. 3. Property values and the tourist economy will obviously be affected. Twenty-six 400-ft-high machines -- turning, strobe-lit, and wump-wumping night and day -- are hard to ignore. A significant proportion of people with a choice will obviously buy or visit elsewhere. Every effort the industry has made to design surveys to show otherwise has been easily deflated. 4. Noisier than you think. Noise is the most common complaint from neighbors of giant wind turbines. It is an unnatural noise, compounded by a resonant aspect that can rattle windows and make some people ill. The noise is usually worse at night. While denying its significance, wind developers try to pay neighbors to sign "forbearance easements" to squelch complaints. 5. Green credits don't mean anything. The logic of renewable energy credits is sound for a more reliable source of energy. But wind does not displace other sources, so the companies are taking advantage of the extra revenue stream without having to show any actual benefit in return. There is no "New England 'green credits' program" as the UPC ad claims. Several states have renewable portfolio standards, whose requirements are met by showing green credits, but UPC can sell green credits, or tags, to anyone, anywhere. Vermont is, however, part of the Regional Greenhouse Gas Initiative, which is indeed a "cap and trade" system. If the Sheffield/Sutton facility would not be involved in it, as UPC and Washington Electric Co-op insist, that's because it would have no measurable effect on greenhouse gas emissions. 6. Who gets the big subsidies? UPC cites only one minor source of the many subsidies for industrial-scale wind energy. The industry's own seminars describe how taxpayers can pay for two-thirds to three-fourths of the cost of erecting giant wind turbines. That's potentially several million dollars per machine. It is true that other energy sources are also heavily subsidized. Other sources, however, unlike big wind, provide useful energy. 7. UPC Wind Partners is a subsidiary of UPC Group, which is based in Italy. UPC Group was established by New Englanders, but in Italy. This dog of a project doesn't even bark convincingly. The Sheffield/Sutton project is, like all industrial wind facilities, a boondoggle whose only success will be the transfer of public money to private investors. The promoters cannot show any evidence to back up their claim of reducing greenhouse gases and pollution. That is the empty hat they are desperate to fill with full-page ads proclaiming "the truth." But their arguments are as puffs of air and don't have a leg to stand on. Good blog out of Cohocton, N.Y.
Also see Cohocton Wind Watch. Here are extracts from a "Wind Farm Neighbor Easement Agreement" drawn up by Zilkha Renewable Energy, which is now owned by Goldman Sachs and called Horizon Wind Energy. Reportedly, current agreements from Horizon are identical. ... Owner understands and accepts that operation of Generating Units may have some impact on the Wind Farm's neighbors, including the Owner's Property. ... Grantee wishes to obtain Effect, Sound and Shadow Easements from landowners who are neighbors of the Wind Farm for the benefit of the Wind Farm and as an opportunity to provide Owner with certain economic benefits to accrue from operation of the Wind Farm. Effects Easement. Owner grants to Grantee an easement, right and entitlement on, over, across and under Owner's Property for any audio, visual, view, light, vibration, air turbulence, wake, electromagnetic, ice or other weather created hazards or other effect of any kind whatsoever resulting directly or indirectly from (a) operations or activities of any Wind Farm or (b) the facilities of any Wind Farm now or hereafter locate on the Wind Farm Property. Owner agrees to consult with and obtain Grantee's prior written approval, in Grantee's sole discretion, as to the location of all new structures greater than sixty-five (65) feet in height proposed for Owner's Property. Confidentiality. Owner shall not disclose to others ... the terms of this Easement Agreement. Notwithstanding anything herein to the contrary, Grantee shall not be required to make any payments hereunder unless and until a wind turbine generator is constructed within twenty-five hundred (2,500) feet of any occupied residential structure on Owner's Property existing on the Effective Date, such distance as measured from the center of the wind turbine generator foundation to the nearest outer wall of such structure. Parker supports wind development and thinks the state can get 15% of its energy from wind, he says that would require at least 100 turbines on ridge lines all over Vermont. "I don't see it as a question of aesthetics I see it as a question of people recognizing wind turbines as we recognize church steeples and silos in barns as a part of something that is making our economy healthy and giving us choices as a state." Vermont uses over 5,600 gigawatt-hours of electricity in a year. That's an average load of about 640 megawatts (5,600,000 megawatt-hours divided by 8,760 hours in a year). Fifteen percent of that is 96 megawatts. The wind power salesmen say the turbines will generate more than 30% of their capacity in a year. The facility in Searsburg, however, generates only around 21% of its capacity each year. The national average output as reported to the federal Department of Energy's Energy Information Agency is 27%, but that apparently does not count out-of-commission turbines. Twenty-five percent (1/4) output is therefore a more realistic, though still generous, estimate. That means that 384 (96 × 4) megawatts of wind power capacity would have to be installed to produce an average of 96 megawatts, or 15% of Vermont's electricity. That would require 256 330-ft-high machines like the four proposed in East Haven, or 192 400-ft-high machines like the 26 proposed in Sheffield and Sutton -- much more than "at least 100" which Parker promises. They are obviously a lot taller and more intrusive than silos and church steeples (in fact, they're a lot taller than the Statue of Liberty, base and all), they are necessarily sited prominently, their jumbo-jet-sized rotors sweep vertical air spaces of 1-1.5 acres, and they are lit by strobes day and night. For practical planning purposes, even more would be required. Because generation occurs only within a certain range of wind speeds and the rate of generation is cubically related to the wind speed between the "cut-in" and "rated" wind speeds (typically 8-30 mph), wind turbines generate power only two-thirds of the time and at or above their average rate only one-third of the time. And since the production responds only to the wind, it rarely correlates with user demand. Even with sufficient excess capacity from other sources on the grid to balance its intermittency and variability, the effective capacity of wind is therefore typically assumed to be a third of its expected output. So 1,152 megawatts of wind -- 576 to 768 machines -- would be needed to reliably provide 15% of Vermont's electricity. The absurdity goes beyond the outrageous scale for such little benefit, because if all of those turbines were actually producing power at once, most of them would have to be shut down, since base load plants can't rapidly ramp off and on.